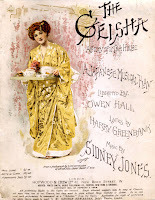 While performed only occasionally today, Sidney Jones’ 1896 musical The Geisha was one of the most popular theatrical productions in the Euro-American West that featured geisha. The plot of My Geisha is a relatively simple one that includes the familiar plot device of love triangles. Geisha in this play are idealized by the British women and men as alluring and attractive. Although foreigners seem to have this rosy picture of life as a geisha, the geisha in the musical present the audience with a different side to the story. When the forced closing of their teahouse forces the sale of the geisha, the audience realizes that the geisha are more similar to slaves subject to the whim of the owners of the teahouses and government officials. Furthermore, although the musical is a love story with a happy ending, the geisha profession is described as one that does not involve love. 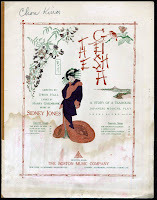 Images of the British and American women’s suffragist movement no doubt served as a provocative contrast to the image of the geisha that emerges in the Jones musical. For this brief period in history when women in Western countries were fighting for their independence, musicals such as The Geisha presented images of women in other cultures as oppressed, often ignoring the women's rights movements occurring there. Perhaps this had the effect of making Western women grateful for the luxuries and freedoms that they already possessed. It might have also inspired them to wish to save the helpless Japanese women whose situation was more dire than their own. I also argue that the image of geisha in Sidney Jones’ musical greatly resembles the portrait of the post-war geisha that emerges in Shirley MacLaine’s 1962 post-war film My Geisha. Why do both the musical and film My Geisha idealize geisha and the country of Japan in such a similar manner? In the late nineteen century, Japan was beginning to modernize after decades of relative isolation during the Tokagawa rule, and during the post-war period of My Geisha, Japan was trying to rebuild after the devastating destruction of war. This is a very interesting discussion and I agree with you. I think the Western idea of geisha is very simplistic. thanks princess--yeah, it's interesting to me too. to tell you the truth, i still don't completely understand what and when the words geisha and courtesan meant what. i mean, i guess courtesan hasn't changed meaning, but it's status in the different cultures is still a little unclear to me. 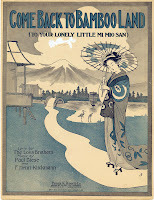 'Come Back to Bamboo Land ' ....... love it.